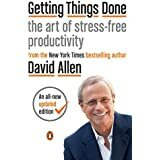 Self help is not a genre of books I read very often, but I made an exception for David Allen’s Getting Things Done: The Art of Stress-Free Productivity. One of my goals for 2017 was to become better organised and to be more productive. I first learned about the GTD methodology through Carl Pullein’s YouTube channel that I follow. I’ve been working on this for around six weeks now, so it’s too early to tell, but I’m happy with what I’ve learned so far. Getting Things Done, or GTD, is a productivity methodology based on a few deceptively simple concepts. Now, I’m still very new to GTD, but this is how I see it. One of the fundamental ideas behind GTD is that the human brain is excellent at processing ideas and being creative, but not a great storage facility. A key part of GTD is getting all ideas, projects and commitments out of your brain and into a trusted system or external brain. Capture: Collect what has your attention. For me, this means adding all my ideas, commitments and to-dos in my list manager application of choice, Todoist. I really love this application and regret that I don’t have it at work. I try to capture everything from my doctor’s appointments, to buying cat food for Lushka to a reminder to ask my husband if we have picture hooks. I’m planning a trip to Europe this summer, so any time I think of something like oh, I must remember to get Swiss francs, into Todoist it goes. Honestly, if I take away nothing more from my experience with GTD than the two minute rule (if you can do it in two minutes, do it now, otherwise delegate it or defer it) and the discipline to define the next physical action to move a task along it will have been worth it. Organise: Put it where it belongs. This is probably the area of GTD that’s least intuitive for me – I’m not very organised! At the very least, I try to put any appointments on my calendar, any tasks in the appropriate section of Todoist, and potentially relevant non-actionable information in Evernote. One interesting aspect of GTD is the use of contexts. This means organising your tasks not by priority but by the tools, location, and/or person you need to be able to complete them successfully. So, for example, in my Taxes 2016 list I have an item; pick up tax receipt from pharmacy. I tagged that as “pharmacy” along with other items like pick up Polysporin and drop off new prescription. So when I go to the pharmacy I just check that tag to be reminded of all the things I have to accomplish while I’m there. Similarly, while planning my trip to Europe I have a context of Susanne, the friend I’m visiting. Any time I think of something I need to ask her, I add it to that list of things to discuss next time I call or email her. Reflect: Review your to do list and calendar frequently. The idea here is to keep your “external brain” current with everything that you need to accomplish. If you don’t add to it or clear our stale items, your real brain will no longer trust your system and it will break down. Most GTDers do a review at least once a week. Engage: Simply do. Pick the tasks that are available to you based on your contexts and get cracking! The book itself is very well written and the edition I have was updated in 2015 to include discussion of new technology (not specific applications) and how it impacts the GTD workflow. if you are interested in improving your productivity and generally getting things done you could do a whole lot worse than to check out this book. I gave Getting Things Done: The Art of Stress Free productivity five stars out of five.